Craft D Cave: Something smells great! Doesn't this look yummy? Guess what! It smells yummy, too! This creamsicle is made with scented embossing powder. On page 35 of the Stampin' Up! Occasions Mini Catalogue you can order it in Vanilla, Melon and Cherry scents. It smells good enough to eat but please don't. You can also make your own scented embossing powder like I did for the above creamsicle. Just mix 1 1/2 tsp of Stampin' Up! Clear Embossing Powder with 1 tsp of sugar free kool aid and Voila! The popsicle stamp comes from a stamp set called Mouthwatering and you will find it in the Occasions Mini Catalogue. 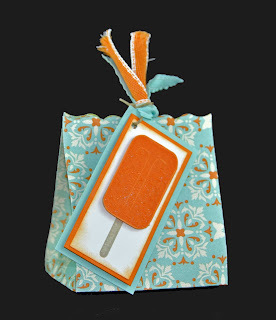 The bag is made using the Fancy Favor Die and the fabulous Big Shot. I used the Everyday Enchantment Designer Series Paper that you can get for FREE right now with a $60 order. It's hard for me to get to sleep tonight. I'm so excited and there is so much to do to get ready for tomorrow night's team meeting. Actually it's tonights meeting since I am keying this in at 12:52am. Irv noticed when he came home that the Dining Room was being taken over. It's a good thing he enjoys eating his dinner in front of the T.V. Love ya, honey and thanks for being so supportive. If you aren't a demonstrator then please consider joining my team. You can join for just $150 right now and you get over $400 in product. You get a FREE magazine once a month and best of all, you can attend my monthly Team Meetings (really parties) for FREE. I will leave you with this thought. Do you know your Stampin' Up! colours? I love the idea of the scented embossing powders. I'm looking forward to trying out the different scents. Thanks for all you do.